As I answered in my last reply, No. We have not engaged a surveyor to create or enhance the field marks which exist in the field. There is one corner of the State's property which is shared with a corner of your client's property, so this would form a good basis for your surveyor to establish such marks. However, looking at the Plot 1 of your client's property, its survey is based on starting from the north east corner of the your client's property, and the state's corner that you share is the south east corner. And since the property's east edge is not straight, and the elevation change from the north east corner to the southeast corner drops by at least 500 feet by my guess, and since plots are projected in the air at constant elevation, a field survey is not a trivial exercise. Our surveyor did his work based on an in-the-office examination of the topographic maps and recorded surveys, and then projected a 90 degree horizontal line up from the property line between your client's land and the State's land such that it encompasses the area of the canyon that requires regular maintenance for the clearing of brush to facilitate the flow of water from your clients land and the watershed that is drained to and through this streambed down eventually to the Lexington Reservoir. Again, as we do not have permission to send our agent to "trespass" on you clients land to construct a precise easement through the canyon (one where we would need to allow for the migration of the streambed over the years as happens in nature) this approximation seemed to be a sufficient level of effort for us to essentially request official permission from your client to trespass over this land to build the pipe in the proscribed manner. We would of course expect to mutually create clear wording in the easement that limits the effect of this drainage easement to only those activities your client is willing to permit our agents to perform. In the pictures you can see fresh white 1/2 x 4 inch plastic slats with attached yellow reflectors which we had Cal Trans install inside our road easement as a way to highlight the edge of the road, so as to reduce the chance that additional people might drive into the hole on your clients property, is this what you are referring to? There are other corrugated steel pipes that are visible in the pictures, hanging in space, draining into the hole; these were a part of the original drainage structure & road construction, which have been undermined by the caving in of the hole. The proposed fix would have pipe added to these to direct their flow of water into the large drain which would be installed. You can see these detailed in the Highway 17 as builts. You are perhaps talking about the grate we installed in the Brush Road right of way north of the site, where we replaced the very small grate that had been there with a larger one which would not be so easily blocked by the buildup of leaves and dirt that wash down with the first storms of the year. As I recall, Sal expressed the idea that the repair of the grate directed additional water to and through the site in a way which aggravated the problem. This is not the case. The way the previous grate operated is excess water which was blocked by leaves would either flow across the grate, and over the ground along the path of the pipe into the same streambed, or flow along and sheet across the road and down around the fish hook, and flow into the same failing drainage structure by way of the hanging corrugated steel pipe that I just described which is visible in the pictures suspended in air. We did do similar grate improvement work much further up the road, which served to direct water which would when that grate was clogged, flow over that grate, and down the road to this same streambed, so that now it flows east down the mountain through another streambed. If you look at page one of the attached PDF, this second grate is about where the number 6 is in the phrase "Perimeter: 6,449.2'" in the engineer's flow study of the watershed of the streambed we are discussing. 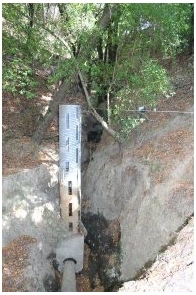 This second grate takes the water it collects through a pipe which drains the water to the alternate streambed that flows down the streambed which has the numbers ".5095" over it. This has the effect of redirecting some of the water that originates from land other than that owned by your client to a different drainage. Of course it only collects that water which lands or, drains onto the road surface. The land up here is mostly second growth forest with some remaining "abandoned orchard" aspects, and so more that 95% of the rain lands on soil, and that water flows through the natural watershed which the hydrologist identified, mapped, and calculated the 100 yr storm flow. As such, to your question about did we investigate other ways of reducing the flow, we did what we could to maintain the grates so that water is properly collected. However, such work can only affect the small amount of water which lands on road surfaces; and only when all pipes and drains are working well. As the engineer advises, we need to design a system that also works when drains are clogged, and nature pounds us with a series of large storms, in order to be good stewards. I would be happy to meet you when you visit; and if you are at all a history buff, I could show you my barn (which was built in 1850, as a part of the Biddle ranch), and my home, which John Steinbeck built in 1938. And in closing, I believe this has been a good process to update you on all of the issues surrounding the drainage structure on your client's land. We very much hope you now have enough information to advise your client to enter into an agreement with the Brush Road Corporation which is sufficient so that we can begin construction of a repaired drainage. 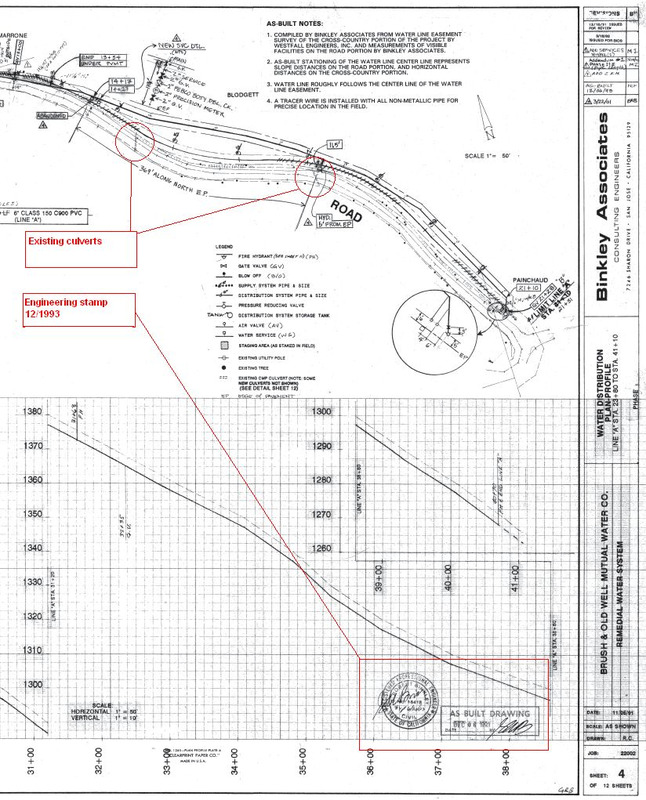 I understand that we may need to stage this where we enter into a preliminary agreement now, and then after construction is complete, have a revised survey conducted which tracks the actual construction and adjusts the boundaries of the easement to the smaller area which is all that is necessary for proper maintenance of the streambed and drainage structure. Perhaps you could draft up the form of such an agreement which we could take a look at (perhaps in parallel to your engaging a surveyor to mark your client's property boundary) so that we can proceed with due haste to have everything in place to facilitate a timely start of construction? Clearly we are not going to make an August 15th construction start date (tomorrow). When do you think is a reasonable target date for the commencement of construction? We need to reserve a time slot with our contractors.